It’s no joke, Garritan libraries are on sale. To save, enter promo code NOFOOLIN18 at checkout. But don’t fool around! This offer expires 11:59 PM MDT, April 7, 2018. Offer excludes CFX and CFX Lite and is valid in the US only. Last week Apple released the new macOS, High Sierra (10.13). A few issues have popped up for Garritan products on computers running the new OS. With the exception of Abbey Road Studios CFX Lite, the installers included with all current Garritan products can hang during install on High Sierra. This problem began intermittently in earlier macOS versions. While the installation goes smoothly for some users, we’ve observed that the hanging behavior has become more prevalent with the latest release. Due to the intermittent nature of this issue, some users have had success simply starting the installation over again. We are actively testing a solution for this problem, which involves building new installers for each product. We’ve already updated Garritan Instruments for Finale, the sample library included with Finale; this was included in our most recent Finale installer just last week. The next installer will be an update to Personal Orchestra 5, followed by all other products currently available at garritan.com. Note that if you have already installed Garritan products on your Mac prior to upgrading to High Sierra, you will not experience these installer issues. While the CFX library works fine with the ARIA Player in High Sierra, the standalone CFX Player (typically used for live performance) crashes if you open the Preferences dialog and then close it. We’re actively looking into this issue as well. More details can be found in this knowledge base article, which will be updated as we learn more. Due to a change in the underlying architecture of macOS components, many Audio Units plug-ins no longer function correctly within Apple products such as Logic and GarageBand running on High Sierra. This includes all Garritan products. Specifically, the ARIA Player and the CFX Player plug-ins may not appear as available plug-ins in these hosts or may produce error messages. This issue is not unique to Garritan (it seems fairly pervasive); it will require many manufacturers to update their plug-ins, and may take us a little longer to sort out. To be clear, with the possible exception of the installer issue, these problems only impact people running the latest macOS. If you are not using High Sierra yet, you can avoid these problems by postponing the update. In the meantime, rest assured: we’re on it. Jon Tschiggfrie joined MakeMusic’s Customer Success team in 2011 and today is the product manager for audio/notation, which includes all Garritan products. Jon’s focus is on discovering what users of virtual instruments really want to accomplish and on envisioning the improved solutions that might actually help people make that kind of progress. If you own a Garritan sound library (including the one that comes with Finale), and are new to Ableton Live 9, this post is for you. We’ll share some tips to help you get started in Live with the ARIA Player you have, regardless of whether you own Live or are using the free trial. In addition to getting everything set up for use, we’ll also address a little more advanced workflow with some ideas for routing. If you’ve used a DAW before, your plugins are likely already active for you. You will, however, need to enable your plugins inside Live 9 before you get started. NOTE: The screenshots below were taken on a Mac. Don’t fear, Windows users, everything will be mostly in the same place. Also, I’ve changed the color of the software (kind of a cool feature in Live) so don’t be put off if Live looks a little different on your machine. On Mac, go to Live > Preferences. Click on the File Folder, and then turn on Audio Units. You might turn on the other options if you have other VST plug-ins. Again, Windows will look a little different (you’ll want to go to Options > Preferences), but this is the general idea. Now that Live has the ability to use 3rd-party plug-ins, it’s time to use them. If you don’t already have a MIDI track created inside Live, you’ll need to create one. To load the ARIA Player, select this newly created MIDI track (to do so, you can click just about anywhere), then look to the left side of Live. 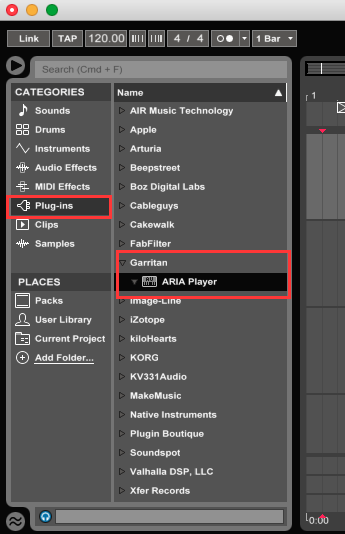 Under categories, select Plug-ins, then in the Garritan folder, select the ARIA Player. TIP: If, like me, you inadvertently close the ARIA Player, and want to reopen it, click the wrench icon on the box above. Now that the ARIA Player is loaded, it’s time to load your instruments and rout them. If you’ve used other DAWs like ProTools or Logic, you may have noticed that the ARIA Player offers several variations of output configurations (Mono, Stereo, and few different Multi-Output options). In Live, the only option available is Multi-Output 16 Stereo. 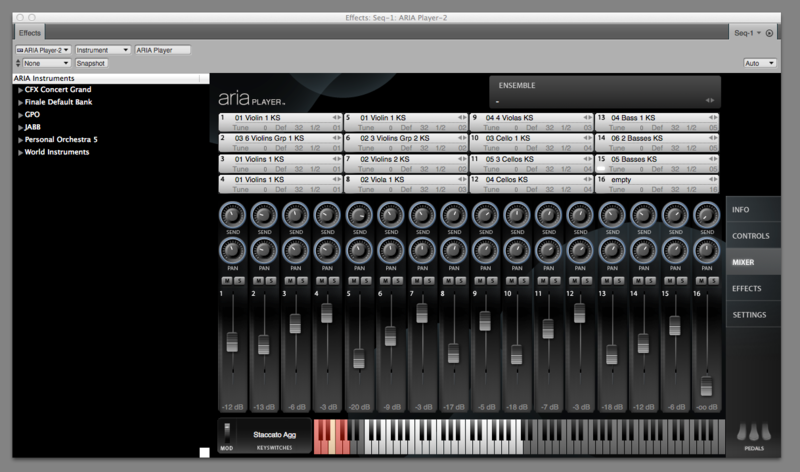 Having a Multi-Output Plug-in is helpful for saving computer power — it makes more efficient use of resources than it would to load 16 different ARIA Players. Within the ARIA Player, all sound is routed to outputs 1 and 2 by default. You can change this by clicking on the “1/2″ setting on each channel. In this example, I’ll be routing 4 stereo outputs. Right now, the Flute is coming out from 1 and 2, the Tuba is coming out from 3 and 4, the Violin is coming out from 5 and 6, and the Shakuhachi is coming out from 7 and 8. Now, how do we create new tracks for the tuba, violin, and shakuhachi? Luckily, Live is pretty smart and this process is easy. Start by creating three new audio tracks (Create > Insert Audio Track). On the first of these three new audio tracks, select the “Ext. In” input and select 1- ARIA Player. 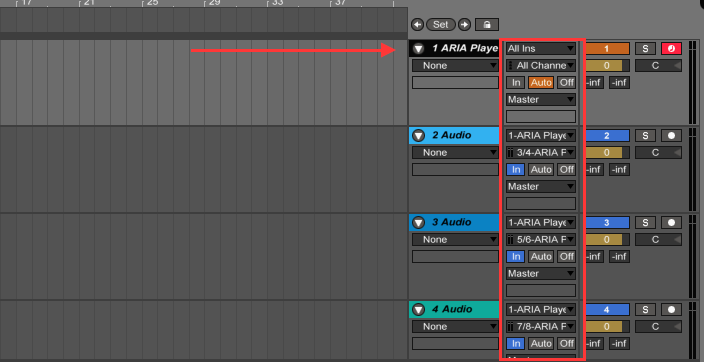 You’ll notice the output sets itself to “Post Mixer.” Select 3/4 ARIA Player. 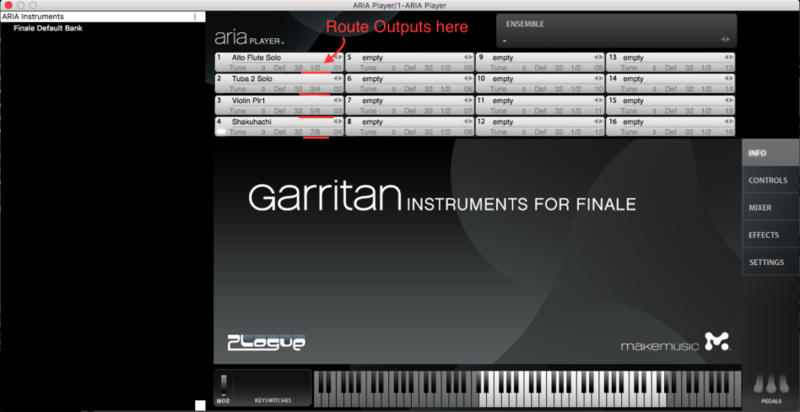 (Your MIDI track with the ARIA Player automatically uses output 1/2). Multiple outputs are great, but they don’t do you any good if you’re not using multiple inputs. You’ll want to send MIDI from Live into the ARIA Player. Again, Live is pretty smart, so this will be an easy process. In this example, I’ll show how to set up 4 inputs. Below the In | Auto | Off section is our area of focus. 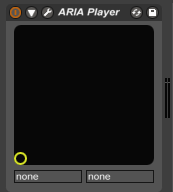 Select “No Output” and select 1-ARIA Player. You’ll notice the box below has switched to “Track In”. Select “Track In” and select 2-ARIA Player. 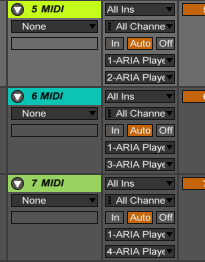 For the Next MIDI track, set “No Output” to 1-ARIA Player again, but set “Track In” to 3-ARIA Player. Continue this process and select the next ARIA Player input. Now you’ve successfully routed your MIDI ins and audio outs, so you are up and running with Garritan Sounds in Live. Please let us know how it’s working for you via Facebook or Twitter. 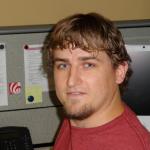 Nick Morris is part of the MakeMusic Customer Success team, originally from Minnesota and now relocated to Colorado. He graduated from McNally Smith College of Music, receiving his B.S. in Music Production. Nick enjoys finding new music to listen to and designing sound patches in his free time. And here’s some great news: our work is just beginning. I recently took on the role of Product Manager, Audio/Notation, placing me in the driver’s seat for all things Garritan. It would be an intriguing challenge for anyone. I have to admit that I’m particularly thrilled to have been entrusted with the Garritan legacy. I began at MakeMusic as a customer success representative. My initial roles were to troubleshoot notation issues for our Finale customers and assist students and teachers in using SmartMusic. In early 2012, shortly after MakeMusic acquired the Garritan Corporation, I was among those chosen to provide Garritan support. In addition to answering phone and email inquiries, we also spearheaded the creation of an online knowledge base. As we developed this resource, my product knowledge and appreciation for Garritan libraries’ capabilities deepened. When a tech writer position for SmartMusic and Garritan became available, I was again chosen for the role. My first project was to collect sources in order to produce the PDF manual for Garritan Harps. This was a real eye-opener into how sample library development worked. A few years later I was doing QA testing and contributing to the Personal Orchestra 5 documentation including our first online-only user manual. Today online manuals are ubiquitous, but at the time it was exciting to be able to continually improve the manual and provide users with the most up-to-date help resources. Today, I’m delighted to concentrate my focus on the virtual instrument world. I’m eager to play a role in the next generation of Garritan development. In the short term, we’re focused on leveraging our vast archive of samples to provide a consistent, low-impact playback experience across the entire MakeMusic ecosystem. We’ve got all these great sounds: it’s time we put them to good use. Concurrently, we are also exploring possibilities for new libraries as well as making significant improvements to existing ones. We have no shortage of great ideas, from which we want to prioritize by what will best serve our customers. For example, should we extend the palettes of libraries like World Instruments and GPO, invest in making a standalone Convolution reverb plug-in, or provide groups of instrument patches in an a la carte fashion? To best answer these and other questions, our plan is to reach out to you. Through user surveys and other market research, we plan to find out what you like about our existing libraries. Perhaps more importantly, we’re also interested in what kinds of tasks you wish you had a better solution for. I believe there’s a great opportunity for discovery in an industry that has reached maturity. Even with all the changes in the digital music universe, our mandate remains clear: provide a reliable, simple, and affordable virtual instrument experience for music creators. It’s a vision that guides all the work we do and assures me that we’re making something that matters. 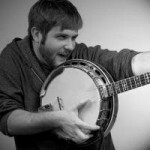 Jon Tschiggfrie was once described by a professor of philosophy (rather hilariously in error) as “a cat who could really cut a rug.” Despite his ineptitude on the dance-floor, Jon managed to complete a vocal and classroom music degree and in 2011 joined the MakeMusic team. Since moving to Colorado, Jon has continued pursuing his interests in choral composition and preserving the American steam calliope tradition (no, seriously, check out the photo above). Captured in historic Studio One at Abbey Road Studios, the CFX Lite is a robust subset of the full, glorious CFX Concert Grand piano (compare both products here). Upon its release, the CFX Lite had some additional features and benefits that were not included in the initial CFX Concert Grand release. (This has subsequently been addressed in a free-of-charge update, details of which can be found here). Among these new additions was a somewhat mysteriously named “Timbre” feature, which I’ll address after a brief side trip back to 1960s London. The collaboration of producer George Martin and the Beatles played a major role not only in the history of Abbey Road Studios, but also in the history of recorded music. The music they created was infused with many unusual sounds, new to radio listeners, that were the product of experimentation with technology. These included tape loops, feedback, automatic double-tracking, tape reversal, and more. While in most cases these weren’t techniques that no one had attempted before, the Beatles team embraced them, executed them really well, and brought them to popular music. Let’s look at one more technique they made good use of: the manipulation of tape speed. There are several examples of Geroge Martin recording Beatle tracks at one speed and playing them back at another. Some of these experiments appear to have had different motivations than others. In the case of “Strawberry Fields Forever,” Martin was faced with the impossible task of joining up two different takes, in different tempos AND keys, into one song. In my opinion, the level of success Martin achieved in “Strawberry Fields” owes equally to his genius and amazing luck (or divine intervention). For anyone else, on any other song, changing the tape speed to correct the tempo would not have magically solved the issue of two different keys. But I digress. On “Rain” the tape speed was also altered but not, apparently, to solve a tempo or pitch problem. Both vocals and backing tracks were recorded with the tape machine running faster and then slowed down in playback to achieve a heavier, trance-inducing effect. Similarly in “Penny Lane,” several instruments were speeded up on playback, including piano. While the end result is very different than in “Rain,” both experiments contribute to a subtle sense that something is slightly different; perfect for the consciousness-expanding mindset of the times. For “In My Life,” tape speed manipulation BOTH solved a performance problem AND created a memorable sonic effect. By October 18, 1965, the song was almost complete except for the bridge. Reputedly Lennon asked Martin to contribute a piano solo, suggesting “something Baroque-sounding.” In the course of the next four days, Martin had dutifully worked up the Bach-inspired piece we all recognize, but experienced difficulty playing it up to tempo. To compensate, he performed the solo at half speed, and his performance was recorded with the tape machine running at half speed. When the resulting tape is played back at regular speed, the solo is heard in sync with the other tracks, at full tempo. It also sounds an octave higher than played. Not only was the pitch and tempo impacted, but the timbre had changed dramatically as well. In fact, many people have mistaken the track for a harpsichord, which masterfully suggests a “Baroque” connotation. The timbre effect in the Garritan piano products allows you to achieve similar results, without a cantankerous tape machine (or white coated lab assistants to operate it). Turning the knob up (or clockwise), produces what I call the “In My Life” effect. The timbre sounds like a tape of a piano that has been increased in speed (but conveniently, without the increase of pitch). Turning the knob counter-clock produces the opposite effect, creating a darker, warmer, mellower sound. “Timbre Knob 0” is the unaltered setting you’d get with the knob straight up at twelve o-clock. Again, note that thanks to the dual miracles of programmers and the technology of zeros and ones, the pitch doesn’t change as you turn the knob, only the timbre (hence the name). I hope you enjoy exploring the timbre effect, and the other powerful controls included in both of Garritan’s piano products. What’s more, I hope you find ways to use these tools that the Garritan developers never thought of – to take things a little further – and thus carry on the tradition of sonic experimentation. Share your results, questions or comments with other Garritan users on Facebook and Twitter. In addition to being MakeMusic’s content manager, Scott Yoho is the leader of the Auto Body Experience, a horn-driven septet that plays his quirky music. He’s also a big Beatles fan. A graduate of the Musicians’ Institute, he earned a B.A. in English from the University of Minnesota. Yoho played guitar with Rock and Roll Hall of Fame member Gene Pitney for ten years and has performed on stages as diverse as hay wagons, VFW basement floors, and Carnegie Hall. Scott’s recordings have been featured in music magazines including Guitar Player, Vintage Guitar, and Keyboard, and he was once interviewed by NPR’s Terry Gross on Fresh Air. In 2014 we released the most detailed and advanced Garritan project ever: the CFX Concert Grand. It began with Yamaha’s remarkable nine foot concert piano, the development of which took more than 18 years. We placed this no-holds-barred instrument in the most legendary recording space in the world: Studio One at Abbey Road Studios. Once there, world-class engineers used the most regarded mics and outboard gear to capture the magic. 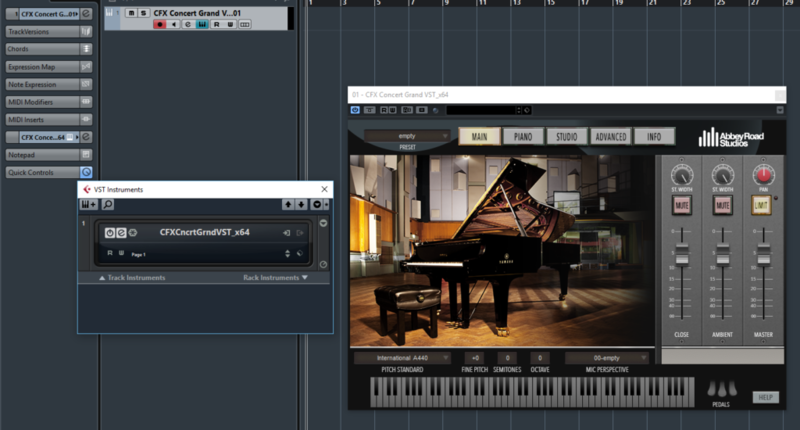 The resulting CFX Concert Grand set new standards for virtual pianos. Today we’re carrying on the Garritan tradition of democratizing music making by releasing the CFX Lite, a downloadable subset of the full CFX that is more affordable, portable, and is compatible with more modest computer systems. Where the full CFX offers close and ambient mic placement for three perspectives (Classic, Contemporary, and Player), CFX Lite offers simply the close-mic’d Classic perspective, provided in all of its full-bandwidth, remarkable grandeur. The CFX Lite includes all 20 layers of detail from the original. This includes separate sample sets for pedals-up, sustain pedal down and soft pedaling. Not sure what we mean by the three perspectives? These are a combination of mics and mic placement designed to create a specific result. Also, each perspective also offers close and ambient mics. For the CFX Lite, we used the close mics of the Classic perspective. The CFX Lite also adds new features not found in the original CFX Concert Grand. These include partial and re-pedaling functionality and 20 additional impulses captured from Abbey Road Studios’ legendary outboard reverb equipment. Also newly added is a Timbre effect that simulates the change in tone that occurs when instruments are recorded at one tape speed and played back at another. Today these enhancements are also available to owners of the full CFX too, via this free-of-charge download for Mac and Windows. But enough talk. To really get a sense of what the CFX Lite offers, you have to hear it. Best of all, you can own the CFX Lite today for only $79.95! As a string player I am most excited about the new strings in Garritan Personal Orchestra 5 (GPO 5). With multiple bowing samples for each instrument, a fluid live-friendly playback engine, and the choice between individual, chamber and section string sounds, GPO 5 has a lot to offer those of us who focus on strings. What you’re hearing is a violin playing a major scale – first as slow, sustained notes, followed by martellato, spiccato, staccato, and finally col legno. Notice how each technique has its own unique articulation and tone. Many composers use these bowing techniques in their scores, but can’t always use them in their MIDI demos. Thankfully, GPO 5 delivers these without the hassle of huge load times or an over-complicated interface. While on the topic of ease-of-use, let’s take a look at how I created this sample. One of my favorite things about the GPO product line is how natural it feels to play on a MIDI keyboard. GPO 5 is no exception. Using a combination of low-octave key-switches and control change messages, writers and performers alike can evoke a huge range of tonal colors. I created the previous scale example by simply playing a major scale multiple times, and using keys in an octave below the instrument’s range to choose a new bowing technique. That’s it! No loading new samples, no switching between multiple channels and tracks. In a word – no fuss. As you can see in the image above, the red keys on the ARIA player’s on-screen keyboard represent available key switches, and if I press one of these keys while playing, it will highlight yellow. This makes it really easy to use multiple sounds at the same time, even while playing live. To my fingers, using a MIDI keyboard feels similar to using preset keys on a Hammond organ. Control change messages are also a common way to change the sound of the instrument you’re playing. These are usually controlled by programmable knobs and faders on the face of the keyboard as well as by your keyboard’s pedals. These messages can control volume, pitch, tone as well as additional techniques like flutter-tonguing and keyboard pedaling. With Orchestral Strings however, these controls are a little simpler. You have basic envelope controls (known as ADSR), a tone control, and my favorite feature: legato controls, including automatic legato. How do the legato features work? In the Orchestral Strings patches your keyboard’s sustain pedal can be used to restrict the instrument to only one note. When you play another note, the instrument seamlessly moves to that new note with a legato effect. 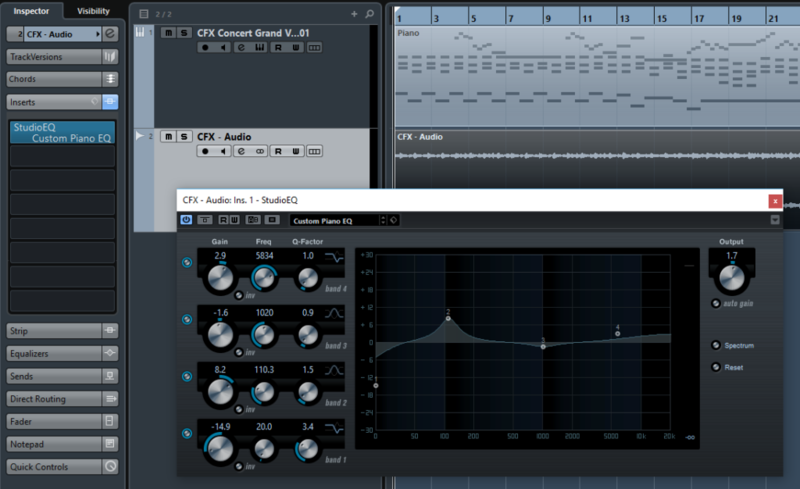 This makes it very easy to simulate slurs and slides on the fly, even while playing a keyboard in a live setting. Automatic legato is a setting which causes GPO 5 to automatically press the pedal for you. Suppose you’re writing a beautiful piece for a small ensemble. While working, you decide you want the closer, more personal effect of a chamber ensemble but your string samples sound like a full-blown symphony. Normally this would leave you with a tough compromise – until now. GPO 5 includes full instrumentation for solo instruments, as well as both large and small string sections. This makes it easy to move from small quartet to big Sinatra-style string sections, and everywhere in between. In this example, I’ve started with a basic string quartet, built into a small sectional, and finish with a full orchestra. I hope you’ve enjoyed this brief tour of some of the string features that I find most interesting in GPO 5. If you’d like to hear more of this library, be sure to check out the audio samples on the GPO 5 audio demos page. Peter Flom is the Production Manager of Repertoire Development at MakeMusic. A graduate of the Berklee College of Music, Peter has previously worked at KMA Studios in New York City, and in MakeMusic’s Customer Support department. He now spends most of his days developing new content for Finale and SmartMusic. 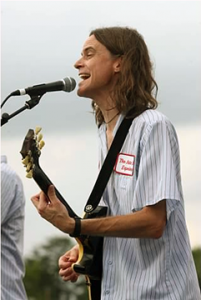 Peter is also a freelance arranger and engraver, and plays a mean guitar when nobody’s watching. The world of digital audio workstations (DAWs) can be a bit intimidating for newcomers. With a seemingly infinite number to choose from, it can be difficult to even know where to start. Today I’ll share some tips to help you get started using a Garritan library with my favorite DAW, Cubase. There’s no shortage of DAWs out there, with their own unique workflows and layouts. I would highly recommend trying a few out for yourself to see which one fits you best. As someone who does a lot of production work, Cubase is a great option for me. It offers a wealth of creative tools that you won’t necessarily find in more recording-oriented programs like Pro Tools or Logic. Although I’ll be covering Cubase in this article, many of the concepts can be applied to any DAW. To get started, we’ll first need to open an instance of a Garritan library in Cubase. 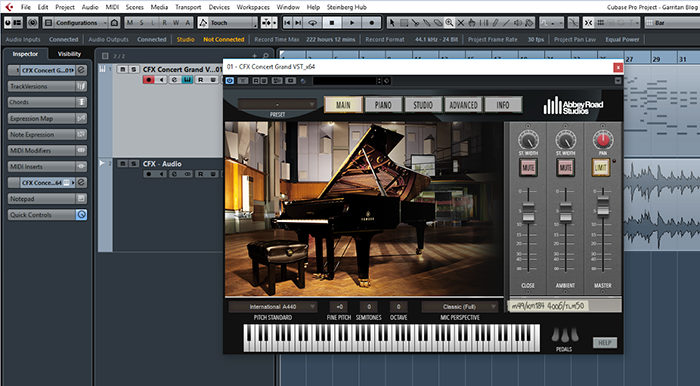 With a new Cubase project open, go to Devices > VST Instruments and select the Garritan library from the Instrument menu – in this case I’ve selected the CFX Concert Grand. 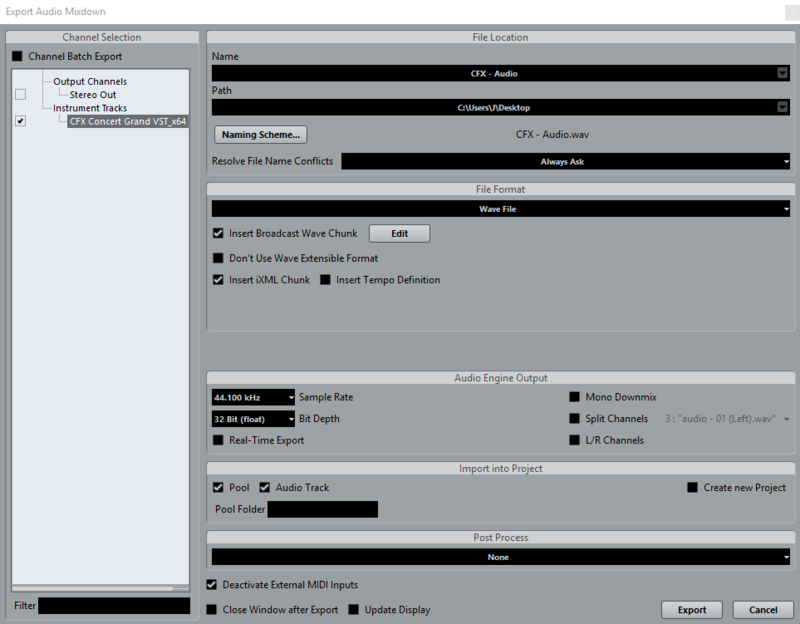 Click Add Track and the CFX Player will display along with a new MIDI track ready to record the selected Garritan instrument. Click the record and and play buttons from the transport at the top of the screen. A new MIDI track will record your performance from the ARIA Player. 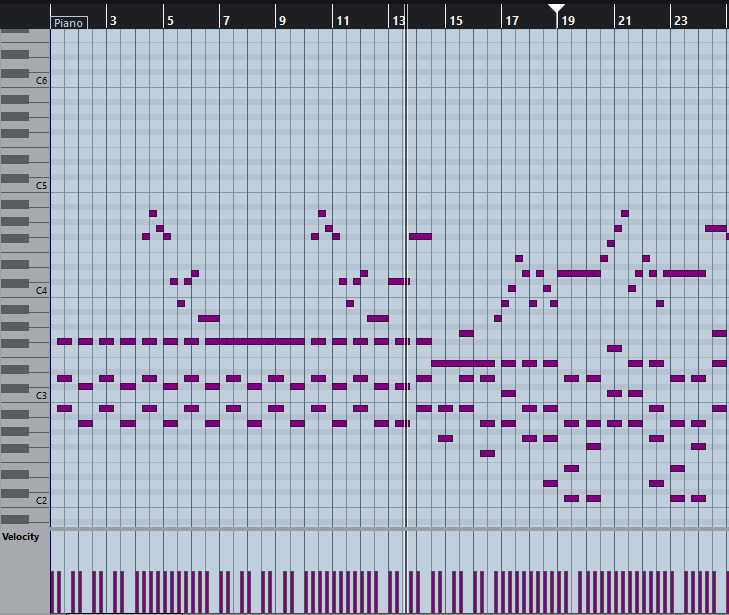 If, like me, you’re not much of a pianist, you can also import a MIDI file to be played back by your Garritan library. To do so, simply drag the MIDI file onto the empty track. Once you’ve recorded your performance, or imported a MIDI file, you can easily quantize playback or customize individual notes. 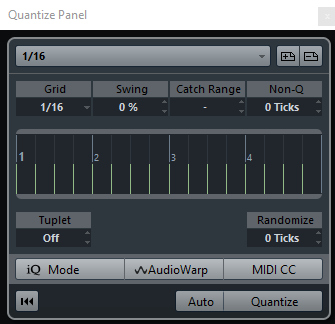 To access the quantization settings, select the track by clicking on it and go to Edit > Quantize Panel. Finale users should be familiar with most of the settings here. Select the smallest note value from your performance and click Quantize. You can also edit each note pitch, length and key velocity by opening the Key Editor from the Edit menu. This can be helpful to quickly correct a wrong note or change the dynamics of a single note or section. Although Cubase offers many tools to edit MIDI, where the program really shines is the large library of audio effects. We can take advantage of these with our Garritan track by first bouncing it to audio. This is easily done. Open the File menu and choose to Export > Audio Mixdown. Next, select the Garritan library from the left menu to make sure that we’re not bouncing the entire project. Under Import into Project, select Audio Track to ensure that the exported audio file is added to a new track in your project. 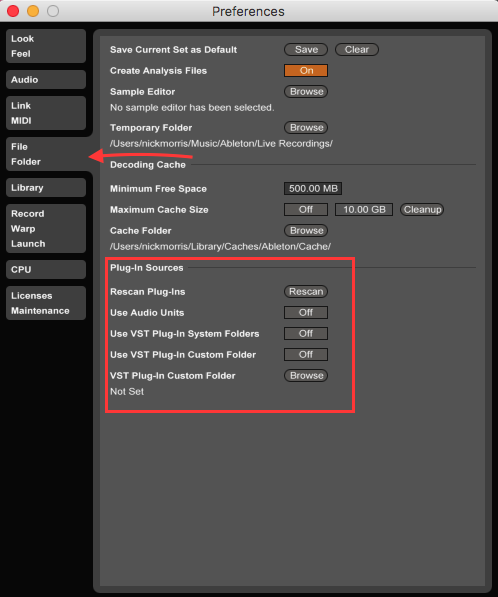 Once you’ve exported the track to audio, you’ll have access to all of Cubase’s audio effects. Select the new audio track and click Inserts from the Inspector. Click one of the open spaces to see all available effects. Once you select an effect, its control window will appear. 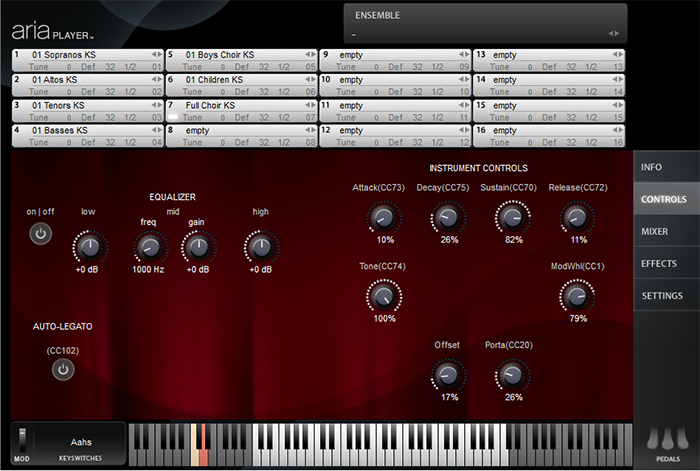 Here you can select a preset, or dig a bit deeper and experiment with each parameter. Hopefully, this basic guide will help to give you a starting point and the confidence to jump into Cubase (or your DAW of choice) and start experimenting. The best way to learn any DAW is to simply spend some time with it and start exploring each feature. Once you have your basic file started following the steps above, I’d recommend hitting Save As, giving the file a new name and just having fun trying everything out for yourself. This way you can always return to your starting point and experiment some more. 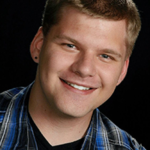 Jon Cielinski joined MakeMusic’s technical support department in 2011. Today he’s a SmartMusic product specialist, answering SmartMusic questions for MakeMusic employees (including assisting customer support representatives) and collaborating with developers on future versions of SmartMusic. Jon also works as a music producer and recording engineer. When not on the job he enjoys exploring the trails around Boulder and taking in local shows. 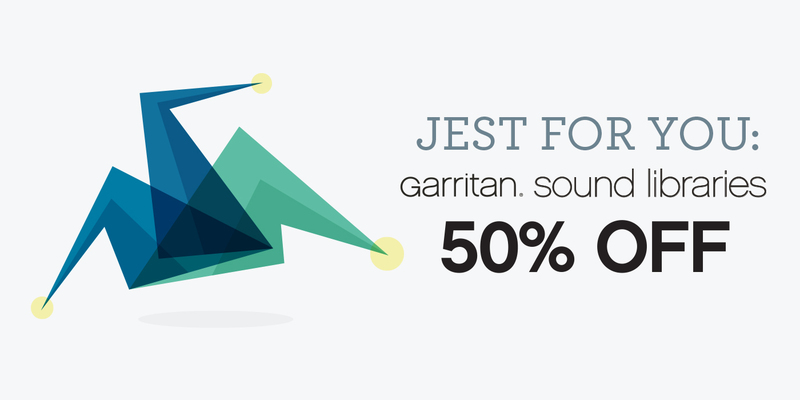 I’m really excited about the new choir sounds in Garritan Personal Orchestra 5 (GPO 5). In the past I’d typically write choral music on the piano (because I didn’t have access to a lot of vocal samples), so these additions are really welcome. Today I’d like to share some tips to help you get started with these new choir sounds. Keyswitches turn specific keys on your MIDI keyboard into on/off switches. In Garritan products you press a keyswitch to change between different sounds from within the same loaded patch. Typically keyswitches are placed at the bottom of the MIDI keyboard beyond the pitch range of the loaded patch. Check out the ARIA Player screenshot at the top of this post. Look for the two keyswitches, which allow you to choose between Ohs and Aahs in the Full Choir. The Ahs keyswitch is selected (indicated by the peach color) while the Ohs key is not (it’s pink). Press either key and it will stay selected until another keyswitch is pressed; there is no need to hold a keyswitch down. 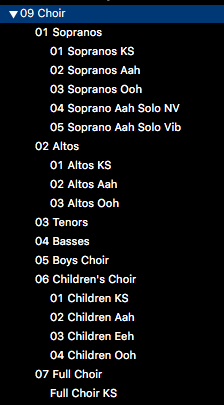 Note that the Children’s Choir and Boys Choir also include a third keyswitch for an “Eeh” sound, and that Sopranos also have a Solo NV (No Vibrato) and Solo Vibrato sound. The new choir patches respond well to traditional velocity data from MIDI keyboards, but I find the choir works best with the ARIA Player’s mod wheel-volume configuration. If you’re new to this, no worries. You don’t need to need to configure anything to make your mod wheel function – it just works. Every mod wheel transmits a very specific piece of data called CC1, the on screen mod wheel will automatically receive this CC1 data. Additionally, you are given full Attack, Decay, Sustain, Release (ADSR envelope) controls, which can be automated. With the ADSR section, you’ll be able to shape how your choir sings their oohs and ahs. For instance, if you want your choir to sound more staccato, leave the Attack, Decay, Sustain, and Release values at 0. If you want the choir to sound more dramatic, set Decay and Sustain to 100, and increase the Attack and Release. If you increase the Attack too much, your choir will always begin too late. Also, if you increase the Release too much, you’ll wait longer for the choir to stop singing. I like to think of Release as a natural reverb. While the look of these knobs and wheels may be a bit intimidating at first, a little experimentation will reap big benefits. You’ll get the hang of it in no time. One of the most important things to take away is that the Mod Wheel and ADSR controls are completely independent of each other. The former is strictly volume and the latter is an envelope for shaping a sound. While volume and envelope controls play a major part of any sampler or synthesizer, there are other controls that are less common but can also be found on many other samplers and synthesizers. Auto-Legato is an on/off switch that makes your choir sing the following note on the same breath (monophonic per patch). The Offset knob controls the amount of delay that occurs between when each note begins and when when you hear the corresponding sound. Porta (portamento) is an interesting parameter, allowing one note to slide into another. With Porta set to 100, the note you are holding down will slide up or down to , the next note you play. Auto-Legato must be enabled for Porta to have an effect. The Tone knob is a low-pass filter. At a low value, you will hear only low frequencies; increasing the value will add back progressively higher frequencies. If you don’t already own GPO 5, expanded choirs and controls are not the only highlights. There are many new features as well as a host of additional sounds; check out these audio demos. GPO 5 is now available for $149 directly through MakeMusic or via your favorite music retailer. I find myself using GPO 5 more and more in my own music projects, and you probably will too. I hope these tips inspire you to experiment with the choir (and other) sounds in GPO 5. Where do Garritan sound libraries come from? Does Gary Garritan create them all by himself in a secret laboratory hidden somewhere in the Pacific Northwest? Is the Yeti involved? No one has ever known – until now. Starting today we’re going public and introducing the people behind the virtual instruments, starting with Chad Beckwith (pictured at left, above). 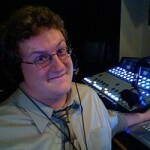 Director of Programming, but I usually describe my role as a technical sound designer. The team roles usually shift from project to project so I’ve always enjoyed that aspect of working with Garritan. What prepared your for your work with Garritan? Are you a schooled musician? Engineer? Sorcerer? I studied music at Northeastern University in Boston. NEU has an amazing music technology program that focuses half on composition/orchestration as well as covering in-depth audio technology and engineering. When and how did you first join the Garritan team? I had previously worked with Gary on projects at Cakewalk as product manager of their virtual instruments. 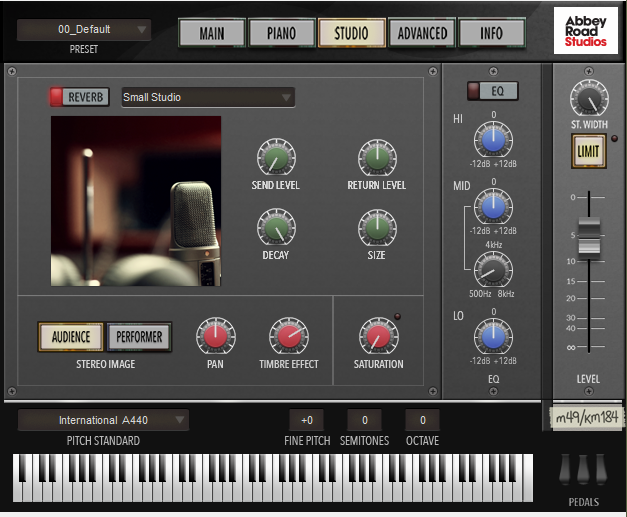 The pocket version of Garritan Personal Orchestra (GPO) is included in the Dimension Pro sample library. A couple years later I had seen Gary and the team at their NAMM booth after their release of the Authorized Steinway. Gary followed up later if I’d be interested in programming more libraries for their new ARIA Player. Coincidentally I was visiting friends in Oregon and was able to be interviewed in Portland on my way home. The interview was at Coffeehouse Northwest, Portland has the best coffee. Have any influential mentors that assisted you along the way? Gary and David Viens from Plogue have also been very helpful mentors over the past seven years. What was the first Garritan project you worked on? Garritan World Instruments. That was an intense project, over 300 new instruments each with their own unique playing style had to be programmed from scratch. I would love to revisit and expand that library now with all of ARIA Player’s new features, body resonances, and sonic morphing. Have any memorable Garritan-related stories? Taking part in the recording sessions at Skywalker Sound was unforgettable. I stood in the middle of the sound stage clapping my hands while the engineers changed the configuration of the studio walls and cut the decay time from 3 seconds to about .5 seconds. It was incredible. It’s clearly one of the best places to record in the world. What Garritan accomplishments are you most proud of? The development, along with Robert Davis, of Instant Orchestra. I’m very happy with the results from Instant Orchestra, the ensemble presets from IO are some of my favorite ARIA Player presets to play. What aspects of GPO 5 are you proudest of? I’m very happy with the shear amount of new instruments we were able to include for the update. It is the largest update to the GPO library since the initial 1.0 release. What aspect of your work on GPO 5 was the most rewarding? The most rewarding aspect is when the library is finally finished. I love hearing user demos within the first couple days after a library has been released. Over the years listening to the activity of the Northern Sounds listening room has been wonderful; they are a group of super talented and active composers. Check out the great sounds possible with Garritan Personal Orchestra 5 thanks to the hard work of Chad (and others) on the GPO 5 audio demos page. Would you like to meet other members of the team, or read about something entirely different? Please let us know on Facebook or Twitter.